HomeSet apart living Training in righteousness Weigh your words…. Can words be measured? Can words be weighed? What is the measure of my words? 6 Let Him weigh me with accurate scales, And let יהוה know my integrity. 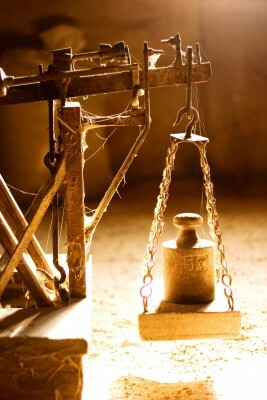 What does weighing and scales have to do with words or with integrity? Picture an old scale, maybe an ancient scale that uses weights for measurement. Now let us say YHVH’s instructions are the weights against which our words are weighed. Put the Word of YHVH into the one weighing pan and your words in the other. How do your words measure against His Word? Would you not like your words to be in perfect balance with YHVH’s. Is that at all possible? We can use words in so many ways to achieve such a varied response. Words are important: YHVH used words to speak the creation into existence. He used words to guide His people in His way. He used words to warn His people of judgement coming when they were disobedient. He spoke through His prophets, and He spoke through Y’shua. He still speaks to us through His Spirit and His Word. YHVH -in His goodness- teaches us through His Word how to use words. The question is: are we willing to learn? This is very interesting! It now explains to me how Solomon could have said that “life and death are in the power of the tongue” (Prov 18:21). We can speak life or death! With words, we have the potential to build someone up as a high tower and so enable them reach their true potential or utterly destroy someone in their own and other’s eyes. Words are powerful! We can do the same for ourselves. Negative words spoken to or about yourself become your reality of yourself. I find it fascinating that “dabar” can also mean to have offspring – to procreate. Look at it figuratively: The effect of words can last a lifetime and can influence future generations as well. The above quote is from a very inspiring book I am reading about kindness. I started reading it on our most-recent visit to Israel. I was sitting on the plane pondering, thinking of how to word a blog post about words in order not to sound condemning, self-righteous or negative in any way. It is easy to quote a few chinese proverbs or words of wisdom and make people feel good about their humanistic inability to do what is right. However, having said that, I don’t want to tickle people’s ears. I want to speak YHVH’s truth. I want to comprehensively learn and effectively teach righteousness. We have a guide for righteousness -the Bible. There are heaps of verses in the Bible about words and their impact. Pleasant words are good to hear and can bring healing to your body and soul(Prov 16:24). A healing tongue is a tree of life( Prov 15:4). A good word eases depression. (Prov 12:25) A soft answer makes anger go away(Prov 15:1). This is by no means an exhaustive list. These are merely a few examples of the effect of sincere and pleasant words. Unfortunately, we as human beings have a sinful nature and speaking pleasant words does not always come naturally. Just put a human being in a stressful situation and through his words you will know what is in his heart. Is this also true for you? I want to survey a couple of different ways in which we can cause irreparable damage to others with our words. We have resolved that we have the remarkable ability to speak life and death with our words. You have the ability to destroy another person in the eyes of another with your words. With your words you can sow distrust and discredit another person to such an extend that other people would choose to avoid them. I have intimate personal experience of this. I think we all do. Without warning you realize your dear friends or even family are avoiding you. Or else people suddenly disregard you. You are not invited or welcomed anymore. Then you full well know – you have been a victim of “lashon hara”. If you slander another individual or gossip about them – true or untrue- you take the life of that person – in a figurative manner (Lev 19:16). Their credibility in another’s eyes are destroyed, maybe even forever. This is called “lashon hara” or evil speech. “Lashon” means tongue and “ra” means evil; so literally an evil tongue. 1 Keep your tongue from evil, And your lips from speaking deceit. 16 ‘Do not go slandering among your people. Do not stand against the blood of your neighbour. I am YHVH‎. and most importantly, is true. Even if a person simply hears lashon hara, it is still considered as if they are speaking it. Ref 4 How are we then to react if someone shares something about another person with you? 17 ‘Do not hate your brother in your heart. Reprove your neighbor, for certain, and bear no sin because of him. “You are to reprove your neighbor for certain and bear no sin because of him”. Not reprimanding a person who is speaking lashon hara about another person will make you as guilty as he is. Therefor you will bear sin because of him. Very practical advice isn’t it? This is not easy though! I know from experience that it is easier to pretend that you didn’t hear what was said than to correct it. We have to train ourselves to live righteously, it doesn’t come naturally. Just remember when you correct someone: do it in love! But what about teachers? I have often wondered what to do in a situation where you know someone is teaching untrue or deceptive content. Would it be considered lashon hara if you warn people about their false teachings? Carefully consider this. I personally would, firstly, verify what he/she taught against the Word and then contact them. No one person has all the truth – I could also be wrong, and moreover, I believe that the majority of people do not intend to spread false teachings. Let us give everybody the benefit of the doubt. Most teachers are approachable and will be willing to listen and respond to differences in a constructive way. However, teachers who are not open to listen and respond to your feedback, make all kinds of warning lights go off for me. Teachers like these are in my eyes false witnesses, and others should be warned about the incorrect or deceptive content of their teachings. It is our obligation to warn fellow believers if we can prove that someone willfully leads others astray. A word of advice here is to follow the principal explained in Matt 18:15. Furthermore, another word of advice: attack the teaching not the teacher. A false witness is one of the seven things that YHVH really hates. There seven things are listed for us in the book of Proverbs. I find it very compelling to see that three out of these seven have directly to do with words: a lying tongue, a false witness and one who cause strife. 16 These six matters YHVH hates, And seven are an abomination to Him: 17 A proud look, A lying tongue,And hands shedding innocent blood, 18 A heart devising wicked schemes, Feet quick to run to evil, 19 A false witness breathing out lies, And one who causes strife among brothers. We have spoken a little about this already. A false witness (Ex 20:16)is also someone who bears a false testimony or teaches deception. That is someone who teaches contrary to YHVH’s truth. Teachers who teach that you don’t have to keep the commandments are false witnesses. We also don’t need teachers to mix New Age beliefs into that which is already contained in the Scripture. It has become very trendy to mix the New Age (occult) teachings of Radionics or meditation -to name but a few- with the Messianic faith. These people teach lies, and YHVH hates lies! YHVH’s Word is truth – His whole Word – from Genesis to Revelation and His right-rulings, judgments or ordinances are everlasting. It has not been done away with! 160 The sum of Your word is truth, And all Your righteous right-rulings are forever. YHVH hates lying! We are probably quick to say that we don’t lie, that is something the unbelievers do, but that is simply not true! Is it acceptable to tell a “white lie”? Is it good to say you would do something and then not do it? Is it ok to imply something that is not true? You can all answer these questions for yourself. There is simply no such thing as a little “white lie” and the lack of integrity in our society is astounding. Integrity is doing what we say we would. Y’shua taught that your “yes” be your “yes.” I have come to realize that I am also guilty of this. I think we are all to some extend. Have you ever told your children that you would do something for them and then forget? I know I have. How is that different to lying? It may not be deliberate, but it doesn’t make it acceptable. What do they learn from that? They learn that it is acceptable to say you would do something and then not do it. I am afraid that is not a good example. These small things do matter! Be careful not to speak idle words. Idle words are meaningless words. Saying something and not doing it is idle words. 37 “But let your word ‘Yea’ be ‘Yea,’ and your ‘No’ be ‘No.’ And what goes beyond these is from the wicked one. 1 O YHVH, who may abide in Your tent? Who may dwell on Your holy hill? 2 He who walks with integrity, and works righteousness, And speaks truth in his heart. We live in a culture where it has become acceptable to lie. Falsehood has become commonplace. We don’t see it as lying anymore. Is it acceptable to be nice to someone but hate them in your heart? That is double-mindedness and double-mindedness is just another word for lying! Is it acceptable to pretend to forgive but, walk around with un-forgiveness in your heart? That is double-mindedness! 2 They speak falsehood to one another; With flattering lips and with a double heart they speak. 8 “Their tongue is a deadly arrow; It speaks deceit; With his mouth one speaks peace to his neighbor, But inwardly he sets an ambush for him. 24 He who hates disguises it with his lips, But he lays up deceit in his heart. 25 When he speaks graciously, do not believe him, For there are seven abominations in his heart. All the above scriptures have one thing in common – what is said does not correspond with what is felt in the heart of the one speaking. This is double-mindedness. Does that sound familiar to you? What do you do if someone lets you down? Do you tell them – “don’t worry, it doesn’t matter,” but in your heart you think: “how dare you?” That I am afraid is double-mindedness! Alternatively, do you sometimes compliment another thinking the opposite in your heart? This is acceptable in our society, but we have to teach ourselves YHVH’s standards. We have inherited lies and deception. We have to be set apart people not conforming with the world and the standards of the society we live in. Another of the seven things YHVH hates is a person who causes strife. The definition of strife is: “bitter sometimes violent conflict, disharmony, infighting, disunity and discord.” Strife causes disunity among believers. Disunity is the new buzz word among believers. Some belief that we must all belief exactly the same, follow one calendar, do the same and think the same. That is simply immature. We are individuals and we will differ in opinion and interpretation, and that is good. 14 The beginning of strife is like releasing water; Therefore stop fighting before it breaks out. 3 Keeping away from strife is an honor for a man, But any fool will quarrel. 25 An arrogant man stirs up strife, But he who trusts in YHVH will prosper. 22 An angry man stirs up strife, And a hot-tempered man abounds in transgression. The next wrong manner of using words is by using profane language. Profane language is using abusive, rude, vulgar, obscene or desecrating words. This is definitely not something YHVH’s set apart people should be using. I need not say more! We are quick to judge. It makes us feel a lot better about ourselves if we can tear people down in our minds. Most people struggle with a low self-esteem. They feel uncomfortable with their current version of the truth and are constantly measuring themselves against others. This measurement inevitably leads to judging others. This can be remedied by renewing of your mind. Be rather bold about what you believe, without being haughty or un-teachable. Be gracious towards others of differing opinion. Don’t forget – we only know in part – all of us. Respect other’s differing point of view without judging them. It is perfectly possible. 36 “Be merciful, just as your Father is merciful. 37 “Do not judge, and you will not be judged; and do not condemn, and you will not be condemned; pardon, and you will be pardoned. 1 “Do not judge, lest you be judged. 2 “For with what judgment you judge, you shall be judged. And with the same measure you use, it shall be measured to you. Words ARE extremely important. Let us intensively study the Scripture and master the best use of words. We can take our example from YHVH. Let us think seven times before we speak. 6 The Words of יהוה are clean Words, Silver tried in a furnace of earth, Refined seven times. My prayer is for Abba YHVH to set a guard before my mouth and to watch over the door of my lips(Ps 141:3). I pray that the words of my mouth and the meditation of my heart be pleasing before You, O YHVH, my rock and my Redeemer(Ps 19:14). Weigh me with accurate scales and know my integrity(Job 31 :6). I pray this for myself and for everybody reading this. Be blessed as you are -with every passing day- formed a bit more in the image of Y’shua our Messiah. Words we speak can bless or curse. Words can shame or even worse. Words can kill, destroying life. Angry words cut like a knife. Words can bring both health and cheer. Causing strife and hate to cease. Merriam-Webster, I. (2003). Merriam-Webster’s collegiate dictionary. (Eleventh ed.). Springfield, Mass. : Merriam-Webster, Inc.